The Department of Homeland Security (DHS) has approved the design of driver’s licenses for illegal immigrants in California. 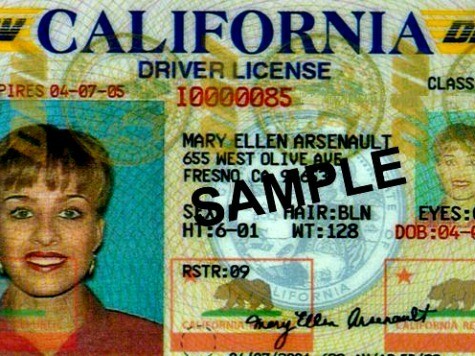 DHS had previously rejected an earlier design (pictured above) because it was not sufficiently distinctive from regular driver’s licenses. According to the Sacramento Bee, DHS sent a letter to Department of Motor Vehicles director Jean Shiomoto on September 17 informing them of their approval. “DHS commends California’s efforts to improve the security of its licenses and identification cards and looks forward to continuing to work with you on this matter,” the letter read. California Governor Jerry Brown signed into law in October a bill that provides illegal immigrants in California with specially-marked driver’s licenses, calling the move “the first step” of a national movement. But the Department of Homeland Security rejected the initial design of the licenses, saying they were too similar to regular licenses. According to the Los Angeles Times, the only distinction on the first proposed design were the letters “DP,” for “Driving Privileges,” in the space where “DL,” for “Driver’s License” was. According to the Bee, the new, accepted design has the words “FEDERAL LIMITS APPLY” written across the front of the license. An estimated 1.4 million illegal immigrants will apply for the new driver’s licenses over the next three years, the AP reported in October. This year’s budget includes $67 million for opening new DMV offices and training staff to handle the expected increase in applications. According to the Bee, state officials estimate the licenses will cost California $141 million over the next three years.